MIDDLESBROUGH'S brave run in the Capital One Cup ended in heartbreaking fashion at Swansea last night. A sterling rearguard effort at the Liberty Stadium kept the Premier League outfit at bay for 81 minutes in a tense quarter-final before Seb Hines headed a Jonathan De Guzman corner into his own net. Playing 24 hours after League Two Bradford had produced the upset of the round by knocking out Arsenal, another surprise looked on the cards as Swansea struggled to break down Championship promotion hopefuls Boro, who were playing their 12th successive away tie in the competition. Ahead of kick-off, manager Tony Mowbray made five changes to the side that started Saturday’s win at Peterborough with three of those coming in the Boro defence. Jonathan Woodgate declared himself unfit after his efforts at London Road and was replaced in the centre by pantomime villain Hines, who had enjoyed a fine game until his late mishap. There was little to choose between the sides in the early stages, though Boro created a half-chance in the tenth minute when Emmanuel Ledesma chipped a diagonal cross into the box. But Lukas Jutkiewicz failed to put any power into his header and Gerhard Tremmel saved easily. 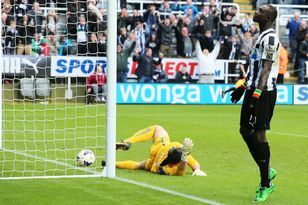 The Swansea keeper faced a stiffer test 11 minutes later when George Friend and Grant Leadbitter linked up well down left, with the move ending when the former cut the ball back into the path of the latter, whose side-footed a first-time shot which the goalie held at full-stretch. Just as the natives started getting restless, the hosts finally fashioned an opening in the 35th minute. Former Boro target Leon Britton sprayed a pass wide to Den Davies on the left and the full-back whipped in a cross which Itay Sheckter headed on and the ball deflected off the unsuspecting Wayne Routledge towards goal but Jason Steele saved. Seconds later a Boro breakaway ended when Faris Haroun played the to Leadbitter, who created a yard for himself with a neat first touch but his shot was well saved by the keeper. Swansea forced back-to-back corners moments before half-time but Mowbray’s men cleared their lines effectively and the only sour note on a thoroughly professional first-half display was Leadbitter’s booking for a text-book block tackle on Davies. Early in the second half Boro hit their hosts on the break with Friend directing a superb diagonal long ball out of defence to Hoyte charging forward down the right but the full-back wastefully blasted wide from distance. Then Leadbitter fired in a low shot from the edge of the box which Tremmel smothered. Just before the hour mark, Ledesma whipped in a dangerous cross from the right which flashed across the six-yard box just in front of Jutkiewicz, who brushed off marker Dwight Tiendalli but couldn’t get a touch on the ball with the goal at his mercy. The big striker did make contact with another superb Ledesma cross in the 61st minute but his header under pressure looped over the bar. Mowbray made an injury-enforced double-switch in the 64th minute with Haroun and Andre Bikey making way for Richard Smallwood and Andy Halliday, with Friend moving into the centre alongside Hines. Swansea upped the ante as the half wore on with De Guzman firing in two shots of vastly differing quality. The first was a tame low effort that Steele saved easily but the second, a stunning long-range direct free-kick, looked destined to dip over the wall and under the bar until the keeper acrobatically tipped the ball onto the woodwork. In the 81st minute, De Guzman finally made a telling contribution when he curled in a corner from the left and Hines rose above Garry Monk and Bailey to head the ball, but he only succeded in directing it into his own net. Boro pushed for an equaliser but failed to test Tremmel and Swansea held on to take their place in the semi-finals. SWANSEA: Tremmel, Tiendalli, Chico, Monk, Davies, Dyer, Britton, De Guzman, Shechter (Moore 55), Routledge (Ki 65), Michu. Subs (not used): Cornell, Bartley, Graham, Rangel, Agustien. Middlesbrough: Steele, Hoyte, Bikey (Halliday 64), Hines, Friend, Haroun (Smallwood 65), Leadbitter (Miller 82), Bailey, Ledesma, Jutkiewicz, McDonald. Subs (not used): Leutwiler, Thomson, Emnes, Parnaby. Booked: Leadbitter, Bailey. IT might be forgivable, even wholly understandable, in the aftermath of Wednesday’s agonising Capital One Cup defeat at Swansea City, had Tony Mowbray spent the long trek home catching up on some shut-eye or with his head in a good book. TONY Mowbray summed up the importance of a final-four Capital One Cup place with a neat trivia question.